My father took up Four Gables at Crays Hill in 1945 after the war. I had been born in 1941. He ran a rabbit farm there for fur and meat. We were only there for a year perhaps as it was soon illegal to use vegetables that humans could eat to feed animals. I remember my mother making bran mash for them in a huge copper in a shed. They lived in a series of hutches. Chinchilla and Rex are names I remember. 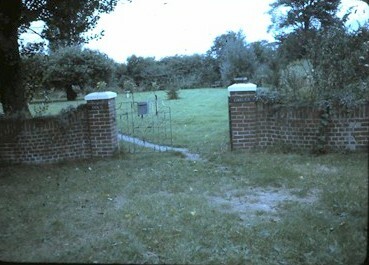 At that time there was a pond between the house and the gate. A footpath ran somewhere behind the property to get to the bus. The house was full of old oak beams and dark timbers. My father took me on his bike to school at Ramsden Crays. I still have my report from 1945. I’m currently living at this house with my parents as I’m 18, we have lived here since 2000. The name Four Gables was transferred to the house on Oak Road as this was a request from the previous owner when we bought the original four gables and part of the land. My father remodelled it himself as mock tudor was the design of the pub he used to drink at in Pitsea, The Railway. The name of the house is another story, which he chose himself also. While it isn’t what it was when we first moved in, I’ve had a great childhood living here and hope the next owners in the future will enjoy this house as much as I have. Adding to my sister’s comments: It was indeed a good place to live. My father had looked at houses in Ramsden Bellhouse and Stock before deciding on the seclusion of Four Gables. The gardens were well established, with an orchard alongside the house. Your recollections about the pond were quite correct. It was filled with rainwater from the roof and an overflow went into the ditch/stream that ran along the back. There was a small gate that led into a dense wood, you could hear the foxes and owls at night. There was another small pond inhabited by moorhens in the corner of the adjoining 5 acre field. The house had its own electricity generator and was fitted with gas lamps with mantles in each room. We removed these as mains had just been supplied. The previous owners used the land beyond the gardens for market gardening and chicken farming. We inherited four large greenhouses and many sheds, including a deep litter house. Winters were not so comfortable. Jubilee Road was overgrown and dad kept his car at the garage down on Oak Road. We had a carved oak signboard down on Oak Road. When I last looked on Google it was still there. I made that out of an old school desk lid! I lived at Four Gables with my family from the late 1950’s to the mid 1970’s -so your father took that photo when we were living there. It had been extended by the people who owned it previously. It was a wonderful place to grow up in. We were contacted by the people who originally built the house, and they gave us photographs of it being built, which I still have. I know what happened to it and why you couldn’t find it too. It has since been (in my opinion, sadly) remodelled. 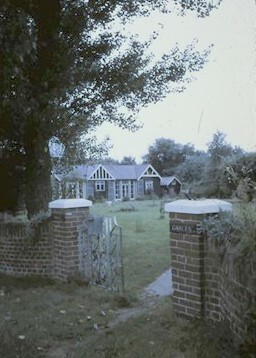 The name Four Gables has been transferred to a new house built on what was the field to the road and the original house is now called Grosvenor house.